When you're looking to enjoy a tire replacement or a repair, our tire service experts will be happy to help. You can use our Tire Finder Tool and shop the Round Rock, TX area for tires. Enter your car's make, model, and tire size to see results! Unsure what your tire size is? Check the side of your tire. It looks similar to a VIN, with a combination of letters and numbers. Once you've selected the perfect set, schedule tire service in Austin, TX with Henna Chevrolet! Our current tire offers are available from the top automotive tire brands. When tires are purchased at a Chevrolet, Buick, GMC or Cadillac dealer. GM is not accountable for the processing or payment of these offers. Long live your tires! Why are wheel alignments so important? They keep the wear and tear on your tires at an even pace. If your wheels are misaligned, your tires can wear unevenly, and you'll begin noticing issues with the handling or vibrations. The most common note of an issue is when your vehicle begins to feel like it's pulling to one side. When you have a tire that's not properly balanced, your ride quality will be poor. If you notice that your car is vibrating when driving on smooth roads, you're probably due for a balance. 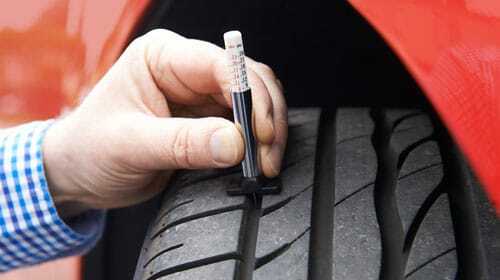 Make sure that you check your tires on a monthly basis, preferably when they're cold. Ensure that your car hasn't been driven in the last three hours or over a mile and then see how the pressure appears. The Tire Information Label is located on the inside of your car's doorframe. You'll find the recommended tire pressure of your car there. Properly inflated tires are a must. Tire pressure is critical to your vehicle's overall performance. Maintaining the correct inflation pressure keeps your tires performing properly. Properly inflated tires provide better fuel economy, stopping distance, cornering, traction, noise, and overall comfort. Use the good ol' penny trick to see what the tire tread depth is looking like on your vehicle. Place a penny upside down between your tread, and if you see Lincoln's head, it's time to pop into our tire center in Austin, TX. The penny test is a fast and free way to see what's going on, or you can use a tread-depth gauge. Regular tire alignments and checks expand the life of your tires and enhance performance. During an alignment, tires are pivoted to accomplish even wear on all wheels. Each wheel has its purpose; therefore each wheel wears at its own pace. Tires ought to be turned every 7,500 miles to avoid unpredictable tire wear. It's vital to pivot your tires as per the right tire-rotation pattern. Doing as such will draw out the life of your tires and will lessen the danger of sudden tire issue. Front tires experience unexpected assignments in comparison to the back tires. A front-wheel-drive auto's tires perform different tasks in comparison to those on a rear-wheel-drive model. Why do we need the Tire Pressure Monitoring System? 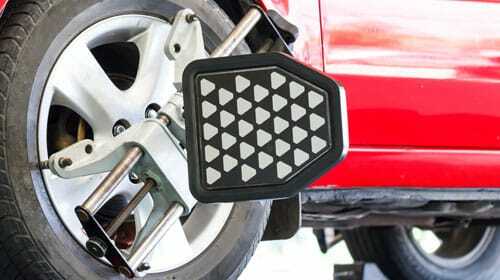 It's designed to warn us of low-tire pressure so that we can fix the issue. These sensors measure the tire pressure and temperature, then transmit data to the monitor. If the pressure in one of your tires exceeds 25% or more below the OEM's recommended cold pressure, you'll see a warning indicator. The Original Equipment TPMS sensor battery lasts as long as ten years with everyday use. If and when the TPMS battery fails, you'll have to replace the sensor. If the Tire Pressure Monitor light appears as a blinking yellow lamp for more than one minute and stays stable, then diagnostic service is needed. If your TPMS is not functioning correctly, it cannot detect or signal a low-tire condition. When you see the Tire Pressure Monitor light appear in the form of a blinking yellow lamp for over a minute only to turn then stable, you need diagnostic service. If you begin to notice that your TPMS isn't functioning, you need it fixed to keep monitoring your tire-pressure conditions. When the light comes on and remains solid with a check tire pressure, add air, or low tire pressure message, then you need to ensure that all tire pressures are at their recommended levels. Then you should drive your car to turn the light off. Q. Why is tire rotation so critical? A. Each tire on a vehicle works differently, making the wear uneven. Consistent tire rotations enable tires to wear equally, thus boosting tire life and enabling tires to be supplanted in sets of four, which is preferable. A. Improperly swelled tires are the main source of tire disappointment when one gets a flat tire. Legitimate tire weight enables a tire to have ideal tread contact with the street, which enhances footing and braking and lessens tire wear. Underinflated tires produce heat, and the wear continues until the pressure pops the tire, so keeping up the perfect measure of air keeps temperatures where they ought to be. A. When you see treadwear indicators, it's time. If your local tire tech runs diagnostics and tells you that you should replace them, it's time. If you see cord or fabric, that's also a clear indicator that it is time. If you're ever unsure, give us a call! A. Our Certified Service specialists can sell you tires that are appropriate for your vehicle, your driving style, and your financial plan. You can begin hunting down new tires at this moment with our Tire Finder Tool above. It's a simple approach to discover tires for any vehicle. Once you've chosen the correct tires, you can plan an arrangement with our tire center in Austin, TX. We utilize production line prepared professionals who utilize cutting-edge innovations and gear to help keep your vehicle running like new.